Using this Doctor Ben's Product: We sincerely believe that this is the most realistic topical application that you will ever find-guaranteed! Granite Ballast Grey Weathering Solution #1056-4 oz. creates that light, dusty grey that is so difficult to achieve with opaque products. Additionally, this Weathering Solution reveals a 3-D effect for more realism rather than just a flat color wash. The Granite Ballast Grey Weathering Solution is also great for that silvery, grey driftwood color that is so hard to replicate in nature. Grimy Dusty Buff Weathering Solution #1057 creates that light, dusty buff (tan) from road travel and wind that is so difficult to achieve with opaque products. Additionally, this Weathering Solution reveals a 3-D effect for more realism rather than just a flat color wash. The Grimy Dusty Buff Weathering Solution is great for use on vehicles, details and toning down that *new* look of fresh paint. Huck’s White Wash Weathering Solution #1058 is just what it says.Everything from lime stains on a locomotive, to faded white washed wood and even the bright white lettering on a sign or on the side of a boxcar; the results are remarkable! Got more ideas for uses? Let us know & we try them out. Pond Scum Weathering Solution #1059 looks just like to sounds. Picture a pond or small lake out in the country or an isolated inlet where there’s not much activity. You look up against the shore and you see this green crud; that’s Pond Scum. But don’t stop there. Look on the shady north side of many structures and you will see this green film of mold and mildew; that too is Pond Scum. And only Doctor Ben’s has it! 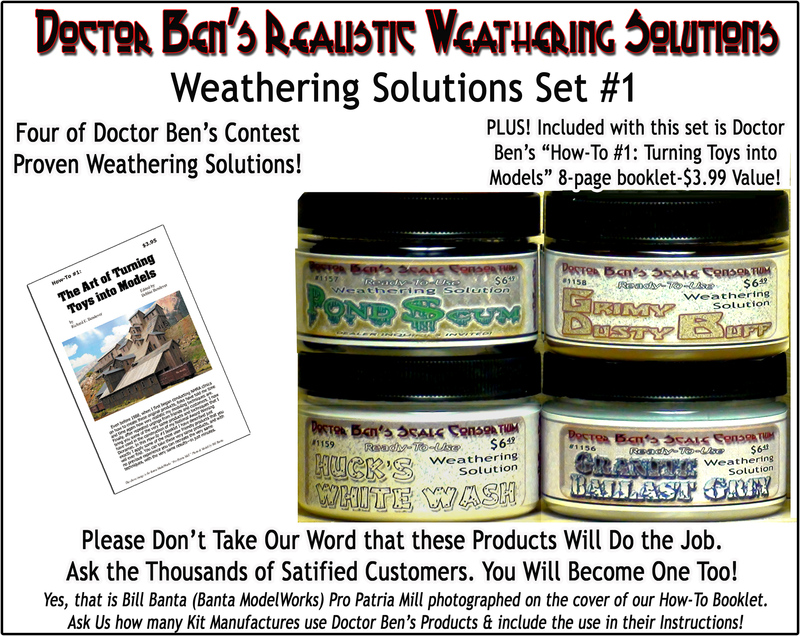 This product works best in conjunction with other Doctor Ben's Weathering Products as well as competitor products. We recommend trying Realistic Rust on top of Instant Age and vise versa. As with all of our products, for the ultimate realism, apply turning your object upside down allowing gravity to pull the residue to the top of the protrusions. This way when you turn it right side up, the residue is not running down towards the bottom of the models and the effect looks just like real life. 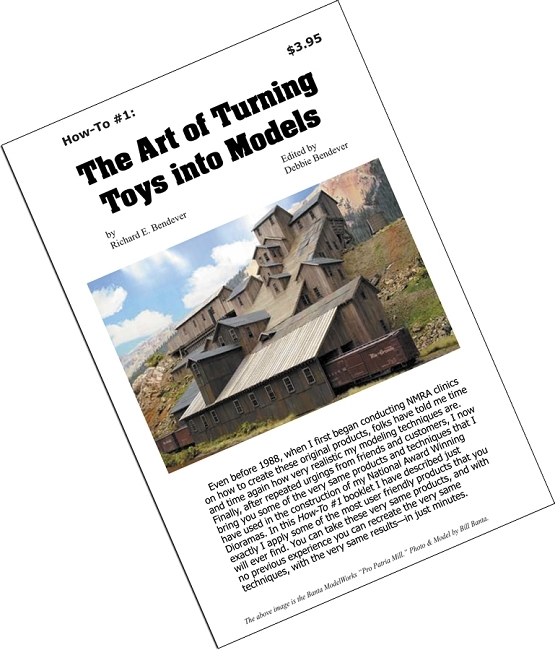 Above How-To booklet is included free in this Doctor Ben's Weathering Solution Set.